A Year of Being Here: Richard Vargas: "why i feed the birds"
"why i feed the birds" by Richard Vargas, from Guernica, Revisited: Poems. © Press 53, 2014. 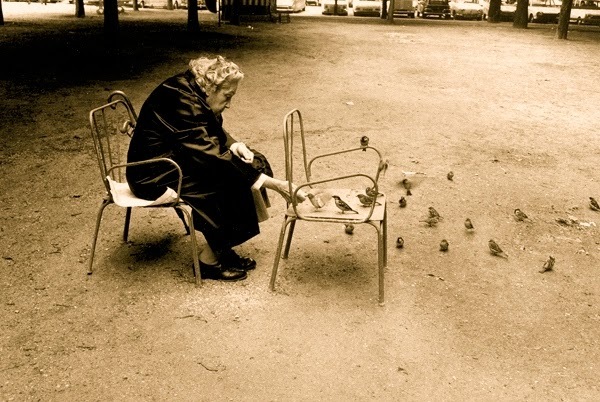 Photography credit: Untitled image by Jill Freedman (originally black and white). thanks for the beautiful presentation of my poem. it was featured on Writer's Almanac on 4/1/2014. a link to purchase the book, Guernica revisited, is on my website. www.richardvargaspoet.com. gracias. Thank YOU for this beautiful poem!